When one hears that a new Central London apartment building is made from refurbished gas tanks, chic may not be the first word that comes to mind. But once you see the structure, you can't help but feel that the design — while uber-industrial and modern — is, in fact, quite elegant. 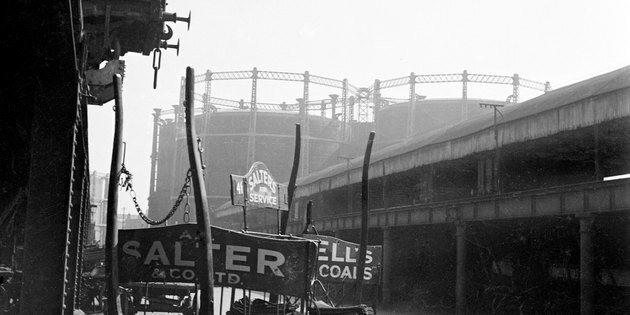 Gas holders — immense gas tanks that contained enough fuel to warm city dwellers — were common throughout London for 200 years, and came in many forms and styles. Over time, the need for gas holders decreased, and by the '90s, many of them were destroyed. A charming and historic part of London's industrial heritage, many people have made efforts to preserve them. 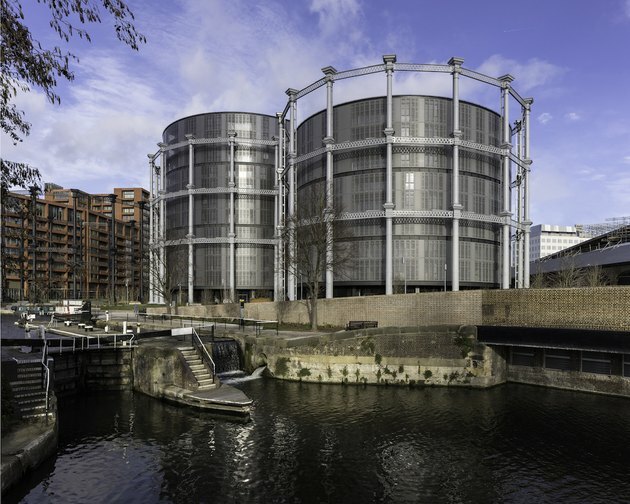 Gasholders London, with its large Victorian-era columns and modern amenities, is one such preservation achievement. 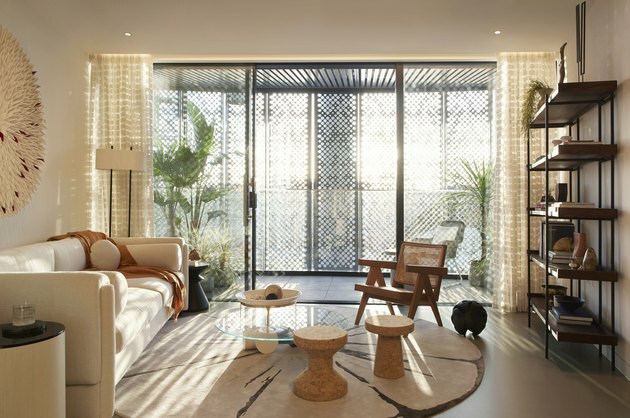 The perforated metal exterior encasing the balcony creates a pattern of light and shadows that is cast across the living room's neutral-hued furnishings. The cork stools designed by Jasper Morrison offer movable seating or side table options. The bespoke wall art, designed by No.12 along with British manufacturer Anne Kyyrö Quinn, is reminiscent of origami paper folding — a material that contrasts nicely with the heavy metals just outside. The rug, a custom work by No.12, plays on the theme of curvatures throughout the room. 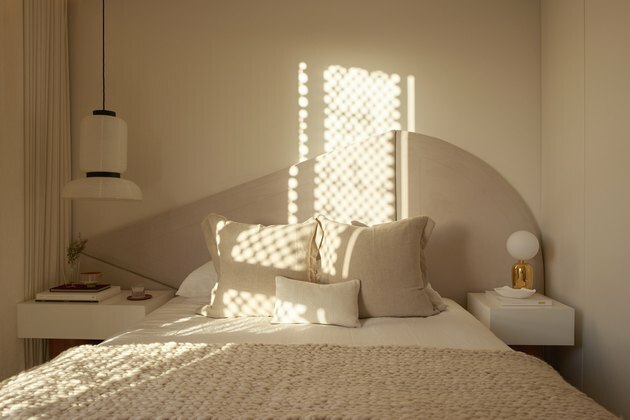 Curtains made by Cameron Broom work in tandem with the eyelet-like holes in the exterior metal facade. Poured resin floors give the shared areas in the apartment a seamless and immaculate feel. 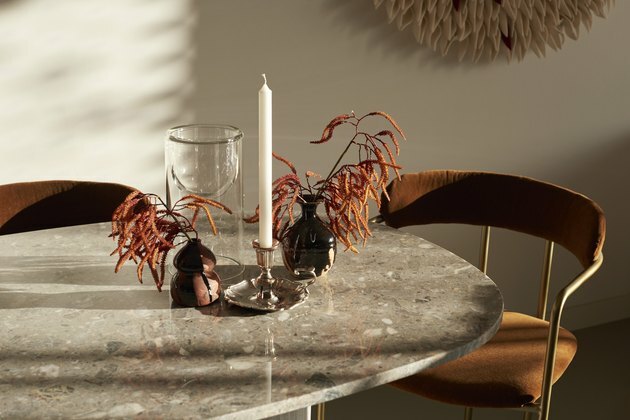 A mix of vintage and modern centerpieces on the custom dining table adds extra character to the modern design. 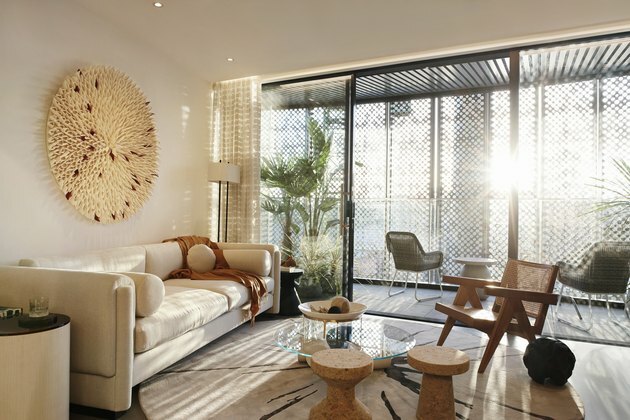 The most complex challenge in designing the two-bedroom, 1,000-square-foot apartment was working with the circular and pie-shaped floor plates. So No.12 developed ways to use curved elements — like this dining table created specifically for the space — that would harmonize with the curve of the walls. 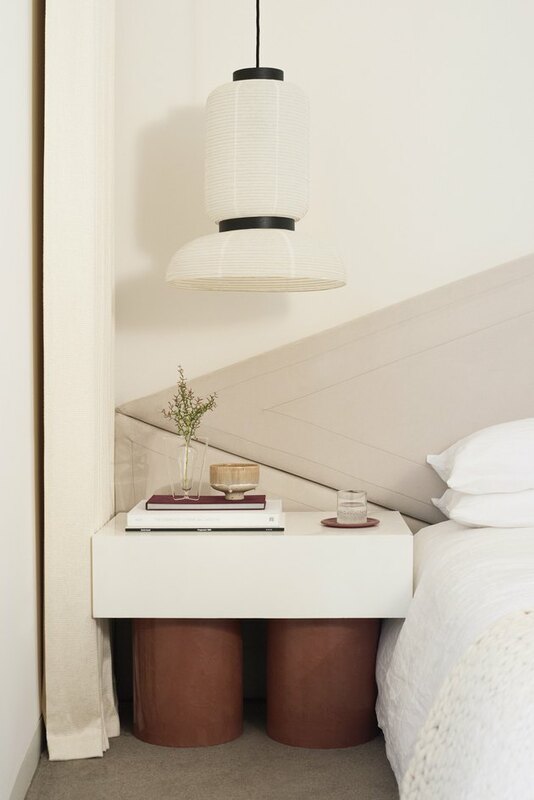 The headboard, upholstered in a faux suede, brings softness to the bedroom. A Formakami paper lantern pendant light designed by Jamie Hayon for &tradition is a take on traditional Japanese lamps. 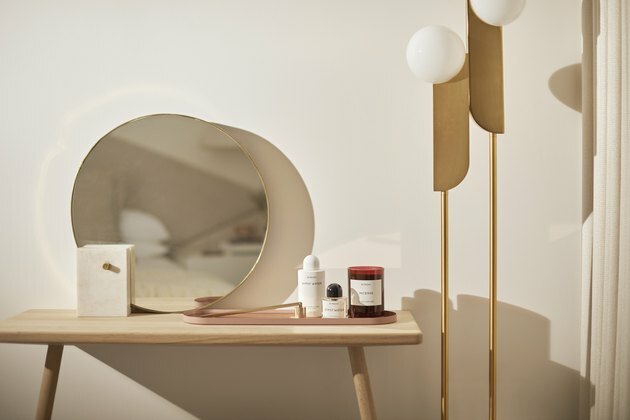 A Georg Console Table made by Christina L. Halstrom for Skagerak Denmark functions as a minimalist vanity with the addition of a Fazer mirror by Studio Gud for & Ratio. 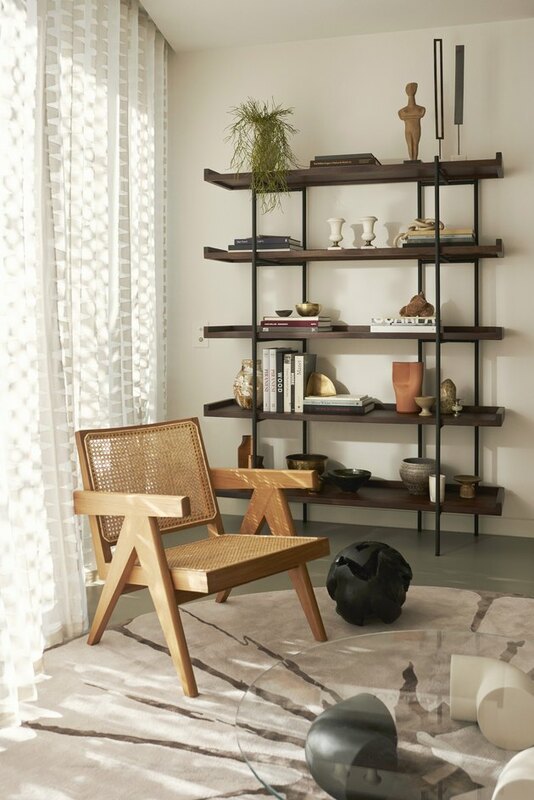 Bower LED floor lamps from West Elm are yet another nod to the apartment's round theme. 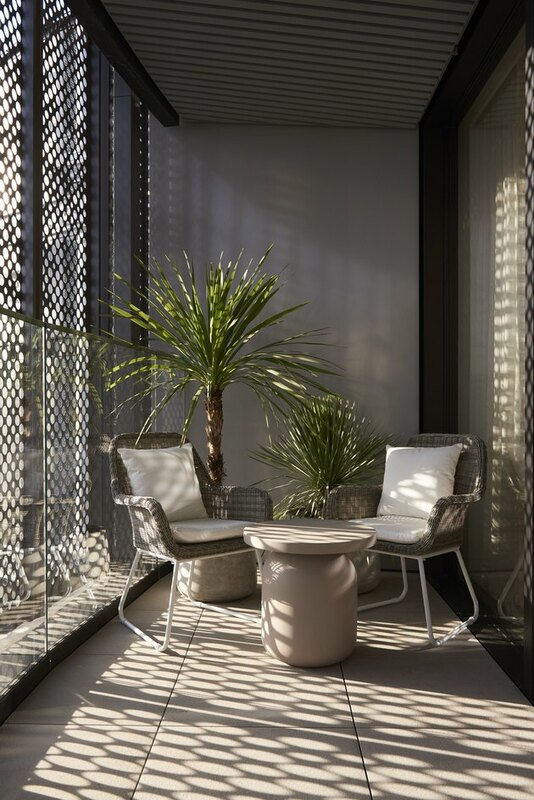 On the balcony, residents can bathe in light as they take in the bustling industrial neighborhood of King's Cross.